Currently there is no national goaltending certification program in Canada . The importance of filling this void and the need to develop a standard is crucial for Canada and the United States if we want to keep up with the rest of the world in developing great goaltenders. Countries like Finland and Sweden have been able to generate great results with limited resources and a very limited number of players compared to Canada. Many European countries have recognized this need and have created national certification goalie educational programs, including Finland and Sweden, which I believe are the leaders in this category in Europe. Finland has had a national goaltender coach certification program established since 1986. Finland’s success is built from the grassroots up. Just one example is having some of the countries best goalie coaches working with young goaltenders in Finland regularly not just solely in the pro and junior ranks. Since Finlands inception of their goaltender certification program in 1986 it has taken almost two decades to start to see results at the top of the global goalie pyramid. Establishing such a program takes time to see results as each year the program is retooled, modified , revamped , and improved. Over the years the program has been developed to the point where results and products of their program are being showcased at the highest levels. The number of goaltenders for the Finns and Swedes are now starting to show in the NHL, the worlds best hockey league.With just 4.56% of registered players internationally the Finns make up 15% of those NHL goaltenders who played 30 or more games last season. for a more statistical look and breakdown of the high percentage of NHL goaltenders being produced from smaller countries check out this article by goalie coach Larry Sadler. Sweden has also followed suit and more recently established a national wide goaltenders certification/education program in the early 2000’s. After spending three and a half years as a goaltender playing in Finland, I took note of how much focus the minor hockey organizations put on goaltender development and the quality of goaltender coaching the youth were receiving. For example, in the Warkis Minor Hockey Organization in Varkaus, Finland goaltenders from the time they start playing goaltender until they leave to play junior, receive during the season: one all goalie on ice specialized goaltending session, two off-ice specialized goaltender training sessions , a goalie coach present at almost all of their team practices , and a goalie coach at all home games. There were two goalie coach leaders for this minor hockey organization that ensured all goaltenders were developing , receiving proper training, and tracked their progress throughout the season and off-season. It was evident that these coaches put forth great time and effort and were very knowledgeable, because they were receiving the goaltenders education/certification program . They were also consistent with the methods that they were teaching directly from their training and certification process. This gives every goalie in the minor hockey program an equal chance to develop. I was also very impressed with the goaltender specific off-ice training, which focused on hand-eye coordination, flexibility, balance, and quick/active hands. The off-ice goaltender specific training program that goaltenders in Finland practice religiously is the single biggest difference between goaltending in North America and Europe. Goaltenders in Finland focus on off-ice training year round which includes mandatory “goalies only” off ice training sessions every week with focus on not just lifting weights but on achieving balance, hand-eye coordination , and flexibility all of which are key elements of being a great goaltender on-ice. Coaches put a big emphasis on these elements and value these types of training sessions as much as their on-ice training. One quick example would be that goaltenders from Finland in the NHL are often known for their “active hands” and unbelievably quick glove hands which is usually credited to their glove positioning but in order to have such a active glove hand the goaltender must be able to have great hand-eye coordination which these goalies have developed through off ice hand-eye coordination training. Mandatory pre game warmups and post game stretches/cool downs are stressed throughout all levels of hockey in Finland.These training philosophies have been infused into Finlands hockey culture by having certified coaches preach and practice their methods that are taught to them by the Finnish Ice Hockey Federation. 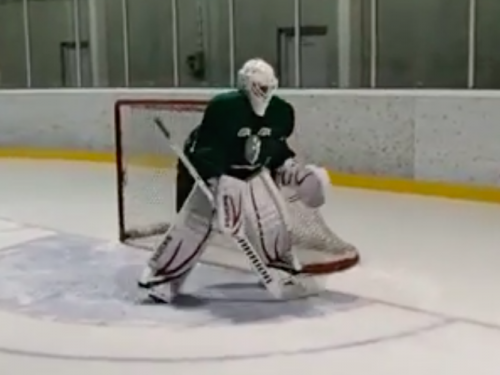 European goaltenders are improving so quickly as they are provided with a goaltending program that is taught to them by certified instructors at every level. If goaltending experts/coaches/trainers in each province of Canada were able to come together and share their expertise, information, and training methods, we could create a goaltending program that could compete with the programs Finland and other European countries have been developing for years. It is time to stop talking about it and put a goaltender coaches certification/education program into action Nationwide. Every goaltending coach needs to receive consistent training so they can deliver a consistent program , and every coach needs to be certified. This would result in optimum development in young goalies as they go through the minor hockey program.Having a goaltender coaches certification/education program would also result in producing more goalie coaches in the region , and see more educated goalie coaches throughout minor hockey . The problem in Canada now is that some goaltenders are receiving strong goalie coaching and training and others are not because we leave the training in the hands of goalie companies to train and provide instruction/education. Which results in some goalies not receiving enough or any goaltender training. What Needs to be in a Goaltender Certification Program. In order to achieve a great goaltender certification program there should be a manual with chapters covering all sections that goaltenders use to develop and improve on and off the ice.This manual should not only be printed and given to everyone who has decided to take the certification program , but it should also be provided online as a resource library that coaches can access. There also should be a system to constantly update the online library as the game changes and new goaltending methods are constantly being developed. Applying such criteria and forming a curriculum throughout an entire organization, province or country would ultimately result in every goaltender having an equal chance to develop.This concept should be lead by Hockey Canada as a Nationwide mandate to set the bar of what should be recommended to goaltender trainers and what should be implemented into minor hockey associations . If an identity of Canadian goaltending is not created by Hockey Canada , goaltender trainers will continually try to reinvent the wheel and resources will be wasted. Depending on the curriculum being taught to coaches, and then passed on to the students, goaltenders would learn methods in a consistent identity and style throughout the country. Before the launching a program everything that would be taught and trained to aspiring goaltender coaches would be based on complete analysis of the game of goaltending. This analysis should start with a team of goaltender experts across Canada and perhaps use outside experts from countries who have already established successful goaltender certification/education programs (Sweden, Finland) to come together to build a goaltender coaches certification program for Canada. After the initial program is established, launched and provided to every provincial hockey branch the program should constantly be evaluated, updated and improved. It should be the responsibility of Hockey Canada to ensure the certification/education program is constantly being improved. An example I experienced first hand while attending The GoaliePro Mentorship Program last summer was that Jukka Ropponen and his team of coaches have been doing full analysis of their programs and the game of goaltending every season. Based on their theories they have modernized their teachings and drills/methods to align with the complex position. 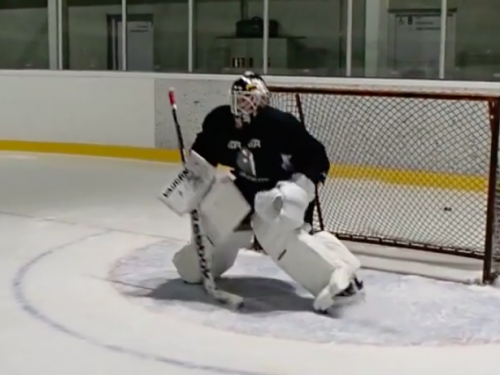 This summer GoaliePro have changed their on-ice and off-ice drills by 30% from last year. This same theory should be applied to a national level goaltenders certification/education program. -Statistics recorded to track goaltenders progress. -Game logs and notes to give goaltenders instant feedback post game. -Selection of proper gear for goaltenders. – Diagrams of recommended ways to properly put goalie gear on. Certification Levels could be tiered into three levels.These levels would be valid for only three years. After three years coaches must have to retake the certification. To ensure all goalie coaches are constantly updating their coaching with new training methods and theory. These levels could be achieved by a similar format that Hockey Canada has established for its standard coaches program. -Hockey Canada needs to develop online resource center that should be open for all coaches that enter the goalie certification program. -DVD’s showing all the drills and training methods would be a useful tool to teach coaches the proper goaltending methods listed above. -Hockey Canada made Youtube Tutorial videos teaching their latest methodology and training methods. -On-ice seminars from top goalie coaches on how to properly run clinics, drills etc. -Certified Sport Trainers could provide seminars on how to properly train goaltenders off the ice. Here is an example of how I have used the criteria and info above to implement it into a minor hockey hockey organization. The past year and a half I have been lucky enough to be given the opportunity to establish a fully comprehensive goaltender program in Bedford, Nova Scotia for the Bedford Minor Hockey Association. There are 45 Male and Female hockey teams part of Bedford Minor Hockey ranging from Novice(Age 5) – Midget ( Age 18). That all receive the Bedford Goaltending Development Program. All goaltenders who are in the Bedford Goaltending Development program receive the following. Goalie coach on Ice for 1 of 2 practices per week. I originally mirrored this program from what I have studied through the minor hockey systems in Europe. As time goes on I am continually trying to add new methods, approaches and ideas to improve the development of the goaltenders. All funds for coaching and resources are comprised from the goaltenders minor hockey registrations. I believe this program is giving every goaltender a fair and equal chance to develop giving the same chance for a “B” goalie to improve and develop as a “AAA” goalie. Some things in the program that will be looked at to be improved in the coming years are. New strategies for getting young players to try out and start playing goalie. Improvement of Novice/IP goaltending program. This article on developing a goaltenders education program is only a small piece with ideas of what could be in a national goaltending program in Canada. I believe if some of the best goaltenders, goaltending experts and coaches came together across Canada to create a certification program for goaltender coaches, a great certification module and program could be created to help out aspiring goalie trainers, parents, and goaltenders across Canada and give every goaltender a fair chance to develop. The need to develop a certification program is integral to help maximize the production of top level goaltenders nationwide. Goaltender Specific Dryland: Incorporating hand eye coordination in dryland training.